It seems that Hollywood will never get tired of producing films based on characters from popular fiction. Superman, Batman, Zorro and Sherlock Holmes have all received plenty of screen time in both television and motion pictures in recent years, sometimes with very profitable results. Joining the list in 2013 will be one of the all-time greatest western heroes, as Walt Disney Pictures will release “The Lone Ranger,” just in time for the 80th anniversary of the masked man’s creation. The intriguing aspect of the upcoming film is the casting of Johnny Depp as Tonto, the Lone Ranger’s Indian companion. With Armie Hammer playing the title role, “The Lone Ranger” has just recently started shooting, ten years after the project was first announced. Moving from Columbia to Walt Disney Pictures in 2007, “The Lone Ranger” is expected to cost $215 million to make. The Lone Ranger originated as a radio show, created by Fran Striker, premiering on Detroit radio station WXYZ on January 30, 1933. Although the program was a western aimed at children, “The Lone Ranger” soon became popular among adults as well, and was successful enough to be picked up by network radio, eventually landing a spot on ABC radio, and lasting until 1954. It was on radio where the most of the Lone Ranger’s most familiar elements were introduced, including the “William Tell Overture” as his theme, silver bullets, and his horse Silver. His trusted friend Tonto was added to the show during its 11th episode, primarily to give the Ranger someone with whom to talk. Seven different actors portrayed the Lone Ranger on radio, most notably Earle Graser (1933-1941) and Brace Beemer (1941-1954). As the Lone Ranger’s persona became established, a back story was created to explain the masked man’s origin. In this backstory, the Lone Ranger was a Texas Ranger named Reid who survived an ambush by the Butch Cavendish gang, an attack that claimed the lives of five other Rangers, including Reid’s brother Dan. Reid is found barely alive by an Indian named Tonto, and after being nursed back to health by his new friend, donned a mask, vowing to devote his life to fighting for law and order. By the 1940’s, the Lone Ranger had branched out to other forms of media, including newspaper comic strips, children’s picture books and Saturday afternoon matinee serials. But it was on TV where the Lone Ranger made his biggest impact, as the Lone Ranger television show made its network debut on ABC in 1949. Both Clayton Moore as the Ranger and Jay Silverheels as Tonto gained national fame in their roles, and the two remained closely indentified with their characters the rest of their lives. The Lone Ranger television series lasted eight seasons, filming 221 episodes, but despite its obvious success, it was always considered a children’s show, never receiving the acclaim given to the so-called “adult” westerns, such as “Gunsmoke,” “Maverick,” and “Have Gun Will Travel.” Reruns of “The Lone Ranger” were part of CBS’s Saturday afternoon schedule for several years, and an animated version of the series also appeared on CBS during the mid 1960’s. Finally, in 1981, the masked man was brought to the big screen when Universal Pictures released “The Legend of the Lone Ranger,” with Klinton Spilsbury playing the lead role. Not only was the film a financial disaster, but also a public relations nightmare, as the producers were granted a court order that prevented Clayton Moore from making public appearances in the Lone Ranger costume he helped make famous. The film was subjected to additional ridicule when it was discovered that Spilsbury’s lines were dubbed by another actor. Eventually, Moore won a lawsuit that allowed him to continue wearing the mask. The upcoming version of “The Lone Ranger” has not been without its problems, changing studios, producers and writers several times before production began a few weeks ago. The fact that Johnny Depp is playing Tonto would lead one to believe that the movie could have a less than serious tone. Although the film is months away from being released, I already have one complaint. 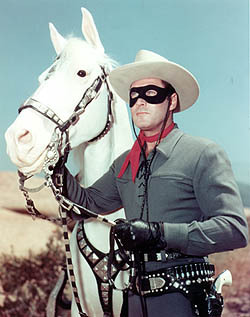 Publicity photos showing Armie Hammer as the Lone Ranger reveal an entirely new look. The Lone Ranger’s traditional light blue outfit has been replaced with what looks like a navy blue blazer. If the Lone Ranger can’t catch an outlaw wearing those clothes, he’ll at least have no problem getting into the Friars’ Club. Note: Due to a contract dispute, Clayton Moore did not play the Ranger during the third season of “The Lone Ranger.” Producers, thinking that the Ranger’s unique outfit made the role easily transferrable, replaced Moore with John Hart, but the public wasn’t fooled, and Moore was brought back, but not before Hart had completed 52 episodes.